IBM scientists today unveiled two critical advances towards the realization of a practical quantum computer. For the first time, they showed the ability to detect and measure both kinds of quantum errors simultaneously, as well as demonstrated a new, square quantum bit circuit design that is the only physical architecture that could successfully scale to larger dimensions. With Moore's Law expected to run out of steam, quantum computing will be among the inventions that could usher in a new era of innovation across industries. Quantum computers promise to open up new capabilities in the fields of optimization and simulation simply not possible using today's computers. If a quantum computer could be built with just 50 quantum bits (qubits), no combination of today's TOP500 supercomputers could successfully outperform it. The IBM breakthroughs, described in the April 29 issue of the journal Nature Communications, show for the first time the ability to detect and measure the two types of quantum errors (bit-flip and phase-flip) that will occur in any real quantum computer. Until now, it was only possible to address one type of quantum error or the other, but never both at the same time. This is a necessary step toward quantum error correction, which is a critical requirement for building a practical and reliable large-scale quantum computer. 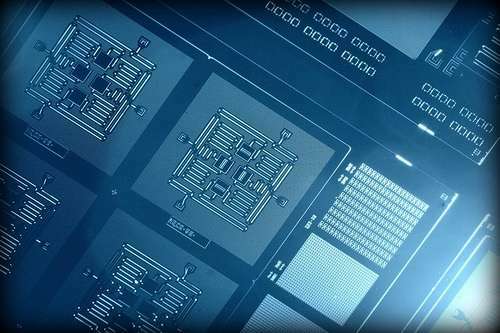 IBM's novel and complex quantum bit circuit, based on a square lattice of four superconducting qubits on a chip roughly one-quarter-inch square, enables both types of quantum errors to be detected at the same time. By opting for a square-shaped design versus a linear array – which prevents the detection of both kinds of quantum errors simultaneously – IBM's design shows the best potential to scale by adding more qubits to arrive at a working quantum system. 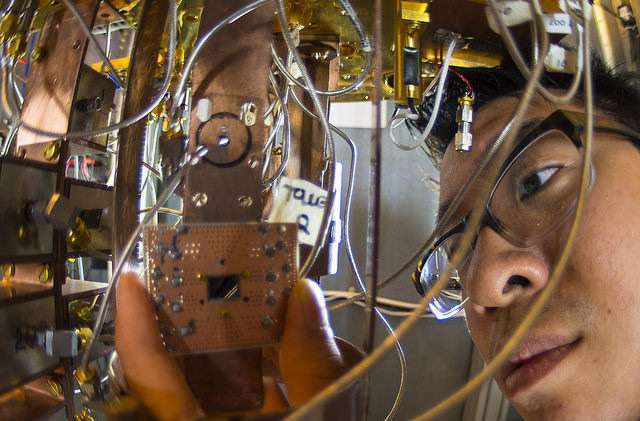 "Quantum computing could be potentially transformative, enabling us to solve problems that are impossible or impractical to solve today," said Arvind Krishna, senior vice president and director of IBM Research. "While quantum computers have traditionally been explored for cryptography, one area we find very compelling is the potential for practical quantum systems to solve problems in physics and quantum chemistry that are unsolvable today. This could have enormous potential in materials or drug design, opening up a new realm of applications." For instance, in physics and chemistry, quantum computing could allow scientists to design new materials and drug compounds without expensive trial and error experiments in the lab, potentially speeding up the rate and pace of innovation across many industries. For a world consumed by Big Data, quantum computers could quickly sort and curate ever larger databases as well as massive stores of diverse, unstructured data. This could transform how people make decisions and how researchers across industries make critical discoveries. One of the great challenges for scientists seeking to harness the power of quantum computing is controlling or removing quantum decoherence – the creation of errors in calculations caused by interference from factors such as heat, electromagnetic radiation, and material defects. The errors are especially acute in quantum machines, since quantum information is so fragile. "Up until now, researchers have been able to detect bit-flip or phase-flip quantum errors, but never the two together. 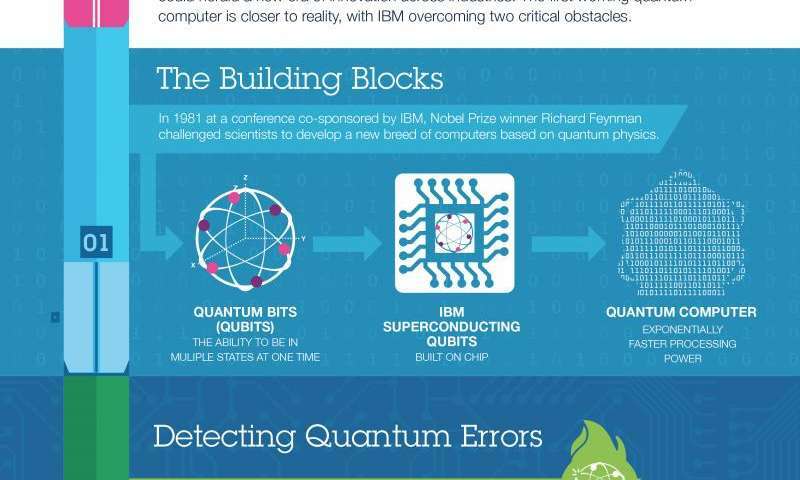 Previous work in this area, using linear arrangements, only looked at bit-flip errors offering incomplete information on the quantum state of a system and making them inadequate for a quantum computer," said Jay Gambetta, a manager in the IBM Quantum Computing Group. "Our four qubit results take us past this hurdle by detecting both types of quantum errors and can be scalable to larger systems, as the qubits are arranged in a square lattice as opposed to a linear array." The most basic piece of information that a typical computer understands is a bit. Much like a beam of light that can be switched on or off, a bit can have only one of two values: "1" or "0". However, a quantum bit (qubit) can hold a value of 1 or 0 as well as both values at the same time, described as superposition and simply denoted as "0+1". The sign of this superposition is important because both states 0 and 1 have a phase relationship to each other. This superposition property is what allows quantum computers to choose the correct solution amongst millions of possibilities in a time much faster than a conventional computer. Two types of errors can occur on such a superposition state. One is called a bit-flip error, which simply flips a 0 to a 1 and vice versa. This is similar to classical bit-flip errors and previous work has showed how to detect these errors on qubits. However, this is not sufficient for quantum error correction because phase-flip errors can also be present, which flip the sign of the phase relationship between 0 and 1 in a superposition state. Both types of errors must be detected in order for quantum error correction to function properly. Quantum information is very fragile because all existing qubit technologies lose their information when interacting with matter and electromagnetic radiation. Theorists have found ways to preserve the information much longer by spreading information across many physical qubits. "Surface code" is the technical name for a specific error correction scheme which spreads quantum information across many qubits. It allows for only nearest neighbor interactions to encode one logical qubit, making it sufficiently stable to perform error-free operations. The IBM Research team used a variety of techniques to measure the states of two independent syndrome (measurement) qubits. Each reveals one aspect of the quantum information stored on two other qubits (called code, or data qubits). Specifically, one syndrome qubit revealed whether a bit-flip error occurred to either of the code qubits, while the other syndrome qubit revealed whether a phase-flip error occurred. Determining the joint quantum information in the code qubits is an essential step for quantum error correction because directly measuring the code qubits destroys the information contained within them. Are analogue quantum computers still wishful thinking? It seems like, even with the high error rates, you could just run the same calculation over and over and choose the answer that occurs most often. Assuming, of course, that the qbits generate less errors than they do correct answers. I have been hoping they could build even just one functional quantum computer, and use it to calculate things. With the amount of power these have in specific calculation types, having just one would be helpful for the whole world. How long before PCs and smartphones have a quantum chip in their CPU and graphics cards? A query system maybe? Type in your request in code form and the computer calculates it and sends you back the solution? They'd only give access to the highest level scientists, and you'd have to pay big, big bucks for it that way. What challenges remain? And why does a square design solve both error correction problems? There are very few details in this article--it reads like fluff served up for the mind of an MBA. PC just got a big, big lead on Mac. How fast can it solve the Towers a of Hanoi? I agree just one QC would be helpful to the entire world but it wouldn't be used that way. And because of its huge potential the country that controls the first QC wins... do not be fooled it is a collabrative effort to figure out the science of creating a QC, but there are races to create a working version. After its creation we have patent laws and whatever it lays down the design for will be patented locking out close competition for 10 years. Room temp superconductors will be a question posed to it, super tensile materials, energy capture, storage, and generation... all it will need is the data we have been collecting in the information age to answer questions in the Quantum Age. In the same way computers compute arithmetic fast and are awesome calculators, QC's will be awesome modelers, allowing all versions of a model to be simultaneously examined. and the best one picked. The issue is that it may be hard to find general answers instead of exact answers. Sometimes it is best to know everything that answers a question, not just the best answer. I'm thinking better pathfinding for traffic problems in cities, or even in video games. Artificial intelligence which is something more than a mere script or linear algorithm. Faster data processing and optimization for telescope arrays. It may even be possible to use quantum tricks to construct a telescope array with the same resolution while using fewer nodes, which would save enormous amounts of time and funding for new astronomy projects. Of course, you need someone to write the algorithm, and you need a processor that is generalized enough to adapt to such algorithms, preferably algorithms would be written in an assembly language and converted to machine code just like classical computers. An alternative is to combine several basic types of Q. processors which each solve one or two algorithms and combine them to work by querying one another with their solutions. Essentially coding at the firmware/hardware level, but this is probably more expensive in total. You are assuming our existing data collection has been deep enough and robust enough for the QC to actually get a "quantum" answer. Until we have a few working models we won't even know how complex the input needs to be to solve some of these problems. First attempts at solutions will be wrong, and will only highlight the need for greater resolution of data inputs. we know how to ask the question -- we learned that basically in the 60's what we don;t have is the language to derive the solution -- that is the QC. The inputs we know and understand. because we can model the question already, but we have nothing that can give us an answer within the next million years, this is the failure of classical sequential computation. I think however that the usage of QC in warfare will lead to true stalemates if both sides have them and have good models. Then why are streets in and between cities always over-crowded, and never updated to the correct needed number of lanes for their traffic load? Revisit this in 15-20 years. It won't be that long now. Well Returnering-Skippy, I am not the science school trained professional like you are not either but I will try to help you figure that out. Maybe because they are not building roads as fast as they are building cars. Or maybe a bunch of Texans moved in and lied about just passing through. But now I want you to help me. This is the article about the quantum computers, not about the traffic problems you are having up-river. Why you ask that silly question here? Cool idea, WG. But Fermilab may tell us quicker using a specialized (holographic) interferometer — see their FAQ page on the Holometer, an excellent place to do a little 'delving' into the holographic principle. You are over stating the capabilities of a quantum computer. You need to look up quantum complexity theory aka "BQP" and you'll see, for example, the air traffic problem you state is not within BQP, but is NP-Hard iirc, equivalent to the SAT problem. While we might be able to estimate a little better, NP-Hard problems are still way too difficult for for even quantum computers to solve. For example, does it make sense to let a bunch of fiercely competitive, irrational, overdeveloped monkeys run the planet? That is really great, I hope it works on a larger scale as well, since the relationship between the amount of data and the number of qubits is nonlinear but exponential due to the chemistry and quantum behavior involved, and that's another challenge in producing sustainable entangled-particle couples that make up the "data" qubits; "syndrome" qubits are not entangled. Worthy of noting is that even with IBM's 4-qubit system, the two entangled "data' qubits need to be low-error qubits for the quantum system to work, high-error qubits cannot be sustained. With the square lattice arrangement one "neighboring" syndrome qubit can detect the "bit flip" error and the other can detect the "phase flip" error as opposed to a linear arrangement where a "neighboring" qubit can detect only one error at a time. Only "neighboring" qubits can have a copy of the data next to them; therefore, you need two non-entangled "neighboring" syndrome qubits for each entangled "data" qubit, that's why you need the square (right angle neighborhood) arrangement. Computers sure have come a long way since I got my Tandy Color Computer 2 with Extended Color BASIC and 64K of RAM. I should probably consider upgrading it before it becomes obsolete, but I just don't know if I'm ready for 128K or RAM. Don't worry, software companies will keep finding ways of doubling your system requirements unnecessarily, even after Quantum Computers become commonplace. Use the quantum computers in fusion plasma controllers for verrrry quick reaction times and measured responses to maintain plasma flow and energy output while suppressing instabilities. You are right i did over simplify but only CS and Math majors appreciate NP-hard and it's implications.